fashion for warmth in snow. starts at the palm, not including the thumb. If you are between sizes or have a thickpalm, choose the larger size. these gloves to avoid losing color. replace it for you or provide a full refund so can feel confident purchasing with OZERO. Perfect Fit for Your Hand's Size - There are 4 elegant colors for your choice: Black, Purple, Brown, Red.And please refer to the size chart in the product image area to find the fittest size. If you like Relaxed feeling, please Choose The Larger Size. Genuine Deerskin Suede Leather |Fashion and Soft| - Made with high-quality and luxurious American Deer leather, OZERO women's winter gloves feature skin-like softness and fashion design to go together with your beautiful dress. Sensitive Touch Screen Gloves for Texting Message and Playing Smartphone Games - With high-tech screen-touch fingertips in the index fingers and thumbs of the right glove, these ladies texting gloves operate smart phone and tablet sensitively, while keeping your hands warm in cold weather dropping between 14°F and 32°F. 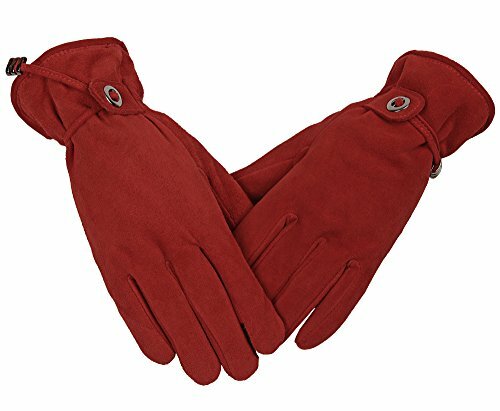 Smooth and Thermal Velour Lining for Outdoor Sports or Driving - Lined with silky and insulated velour, these thermal gloves are thin and windproof but warm, protecting your hands from chill and wind while giving you rare softness and freedom of movement in spring, fall and winter. Elegant Ladies Clothing Accessories for Social Gathering - These leather gloves are full-deerskin and with slim design, you in evening dress will love to wear them. Best Gifts for your wife, daughter, mum, etc. If you have any questions about this product by OZERO, contact us by completing and submitting the form below. If you are looking for a specif part number, please include it with your message.